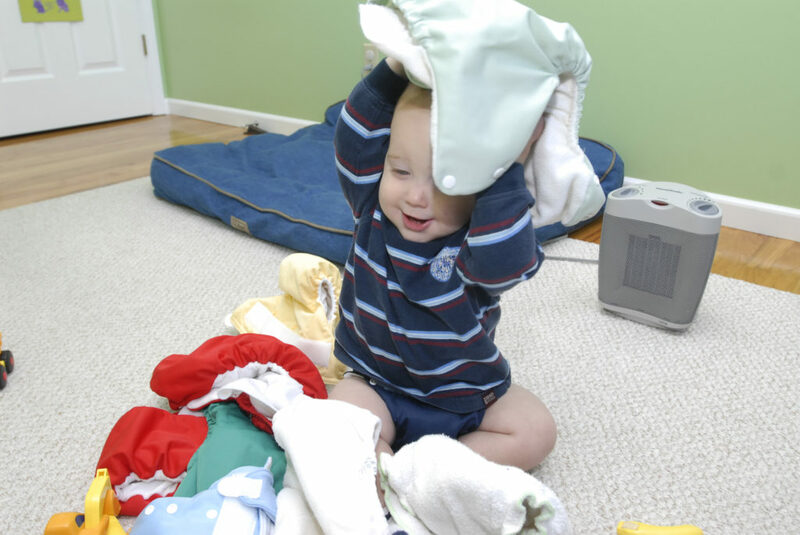 One-year-old Max Ruland plays with his cloth diapers in his room. His mother, Sandy Beverly, says buying used diapers makes cloth diapers more affordable. She also cuts down on the cost by washing the diapers herself rather than paying for a diaper service. Sandy Beverly and her 1-year-old son Max play in Max's room on Thursday. Beverly says she decided to try cloth diapers because she thought it was better for the environment and cheaper than using disposable diapers. Sandy Beverly sets cloth diapers out to dry on Thursday while her 1-year-old son Max watches. Beverly says using cloth diapers requires a bit more work than using disposables, but the extra effort is worth it for the environmental benefits. Where: Lawrence Public Library, 707 Vt. When she’s putting out her son’s cloth diapers to dry in the backyard, it occurs to her that mothers have been performing roughly the same ritual for centuries. What’s also nice, Beverly says, is that she feels like she’s doing her part to protect the planet by using cloth diapers. She’s not alone. An abundance of Web sites and bustling message boards, as well as two national organizations devoted to cloth diapering – the Real Diaper Association and the National Association of Diaper Services – suggest a slow resurgence in the practice. That growing interest seems to be reflected in Lawrence, where Amber Lehrman and her husband recently sold the city’s only diaper service – which they opened three years ago – because business was getting too brisk. And that doesn’t account for parents who wash diapers at home. Still, the practice is far from mainstream, even in liberal Lawrence. That’s why Lehrman, Beverly and two other local mothers are playing host to an information session about cloth diapering on Saturday morning at the Lawrence Public Library, 707 Vt.
Beverly used disposable diapers with her first son, Simon, now 4 years old, because she thought cloth would be a hassle. But by the time she had her second son, the Lehrmans had opened Express Diapers in Lawrence and Beverly gave cloth a try. “Eventually I found out it was not overwhelming to wash them myself,” she says. Cloth diapers are generally made from cotton. The most basic styles are secured using safety pins or hook-and-loop fasteners. A waterproof cover goes over the diaper to prevent leaks. Cloth diapers are bulkier than disposables. Most single-use diapers contain a chemical called sodium polyacrylate, which absorbs up to 100 times its weight in water and allows manufacturers to streamline their product. Cloth diapers, on the other hand, get their absorbency from additional layers of fabric. Beverly has learned to accommodate that extra bulk. Some diaper covers incorporate Velcro and snaps. There are even all-in-one models, which can cost up to $18 each, that combine diaper and cover, making changes as simple as with disposables. And with diaper services – which Lehrman says cost a few cents more per diaper than buying disposables – parents can toss soiled diapers into a pail without even rinsing them, put them by the curb once a week and wait for new diapers to arrive. The bonus, Lehrman says, is that cloth-diapered babies tend to potty train up to a year earlier than those who wear disposable diapers. That more than pays for the extra expense of a diaper service, she says. Although routines vary by household and a baby’s age, Beverly says she washes a load of cloth diapers every other day and hangs them to dry. She believes the amount of water and other resources involved in that process pales in comparison to the energy consumed in the production and distribution of disposable diapers. Indeed, there are passionate advocates on both sides of the debate, which apparently escalated in 1990, the 20th anniversary of Earth Day. Many states were considering taxing or banning sales of disposable diapers. Industry leader Proctor & Gamble commissioned a study on the environmental impact of its product that found laundering a cloth diaper over the course of its lifetime consumed up to six times the water used to manufacture a single-use diaper and produced nearly 10 times the water pollution. For their part, cloth diaper proponents cite reports that say 18 billion single-use diapers are thrown in landfills each year, taking as many as 500 years to decompose and commonly containing raw, untreated sewage. They also say it takes upwards of 82,000 tons of plastic and 1.3 million tons of wood pulp, or a quarter-million trees, to manufacture the disposable diapers that cover the bottoms of 90 percent of the babies born in the U.S.
Cloth diaper proponents also have concerns with chemicals used in disposable diapers and say diaper rashes occur less frequently with cloth. Karl Brooks, a professor in Kansas University’s environmental studies program, hasn’t researched any scientific studies about the environmental impacts of cloth versus disposable diapers. But as a parent of two children during the disposable era – and someone who has thought a lot about environmental policymaking in America – Brooks believes cloth diapers will remain a minority choice. “American families seem to have very little ‘disposable time’ to pick up the intensive responsibilities of using cloth,” he says. “My mom in the 1960s probably spent dozens of hours a week managing cloth diapers, and she didn’t work outside the home. Brooks encourages environmentally minded people to lobby diaper makers to use recyclable materials for the paper and plastic components of their products. “Gigantic businesses that make disposable diapers are much better placed to absorb the costs of using those materials than are families,” Brooks says. Beverly, who recently left a full-time job to stay home with her 1-year-old son Max, doesn’t get too wrapped up in diaper politics. She’s more interested in the practical underpinnings. In fact, she uses disposable diapers at night because Max wets through cloth then. “One of the things I want people to know is that it doesn’t have to be all or nothing,” she says. Beverly says the initial investment in a cloth system might seem cumbersome. The simplest prefold diapers, purchased new, can run more than $20 per dozen. But Web sites like diaperswappers.com offer used products for lower prices, and cloth diapers can be used hundreds of times before they wear out.